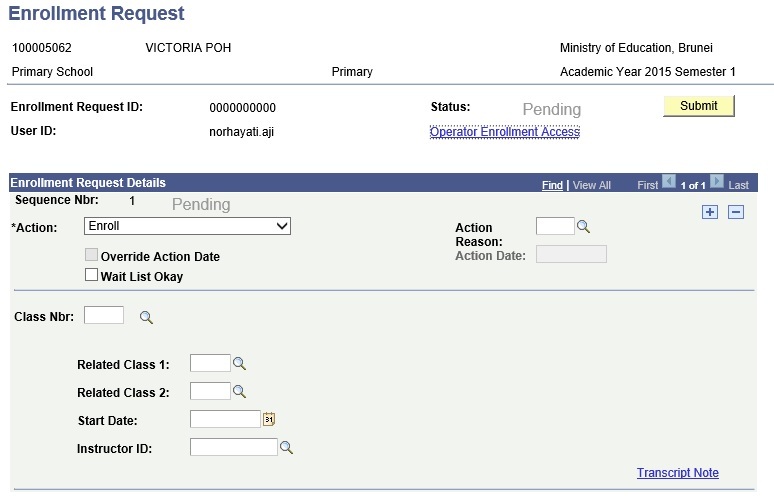 This function allows the users to record the outcome of completed Student Transfer Request. 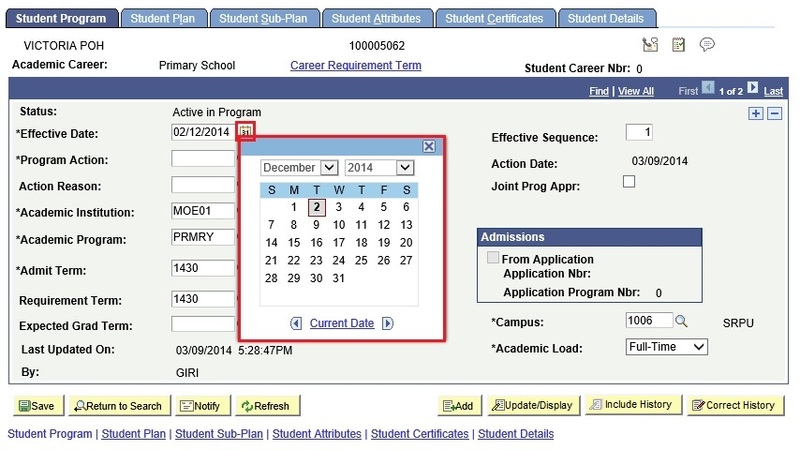 Navigate to Main Menu > Records and Enrollment > Enroll Students > Enrollment Request. 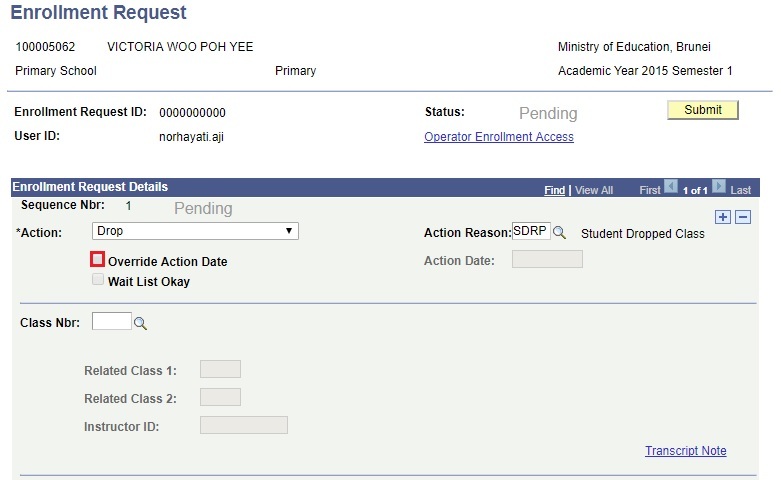 Click on the lookup icon to select the Student who has requested to transfer in the Student ID field. 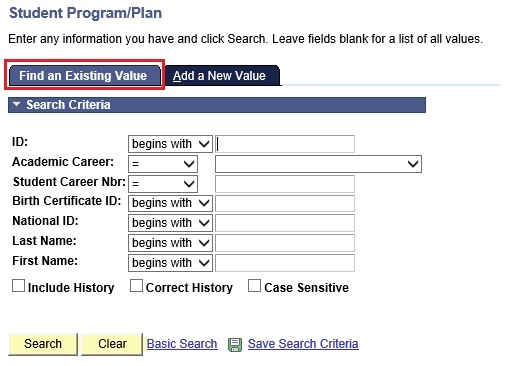 Click on the lookup icon to select the Academic Career of the Student. 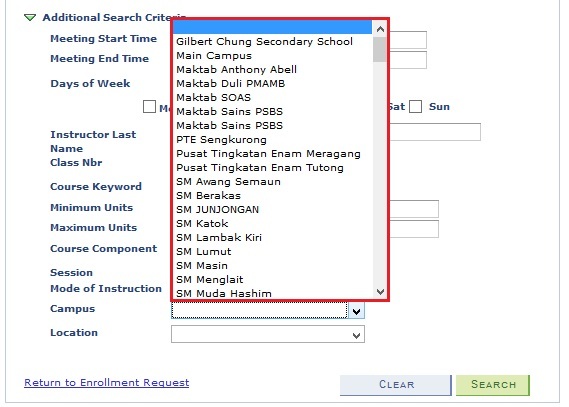 Click on the lookup icon to select the Term in which the student is transferring from. 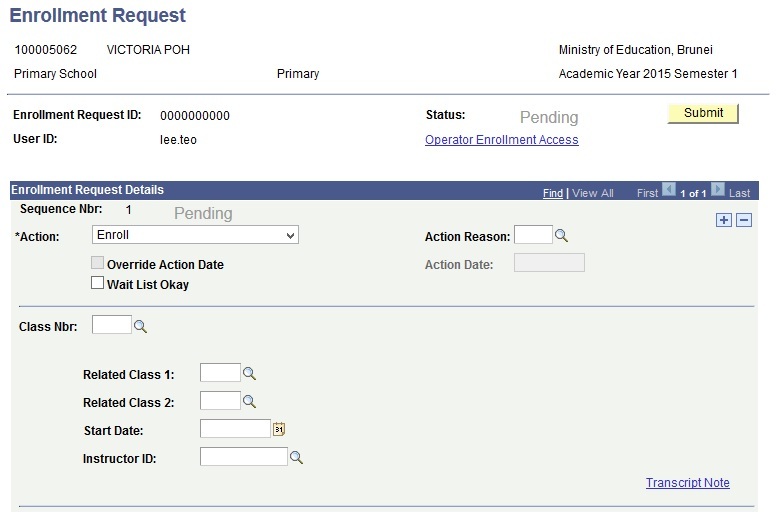 Since the student will leave the current school and class section once the Transfer Student Request is completed, the students’ enrollment in all the current classes should be dropped. Select ‘Drop’ from the Action drop-down list. 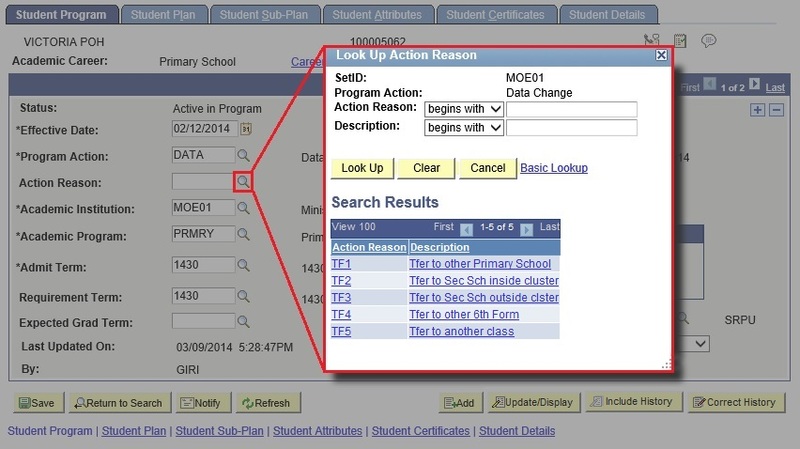 Select ‘SDRP’ – Student Dropped Class from the lookup icon for the Action Reason. Select ‘Override Action Date’ checkbox. 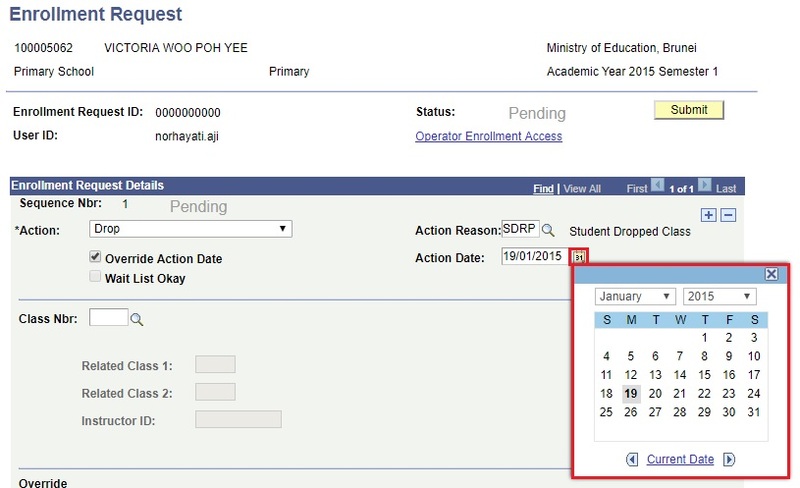 Click on the Calendar icon to select the Action Date when the student drop from class. 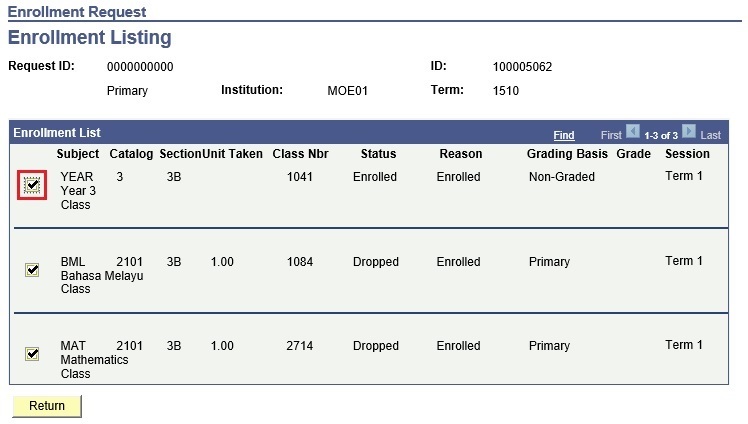 Repeat steps 12 and 13 until all the classes the student is enrolled in are added to be dropped. Every time the ‘+’ icon is clicked, a new Sequence Nbr is added to add the Class Nbr. 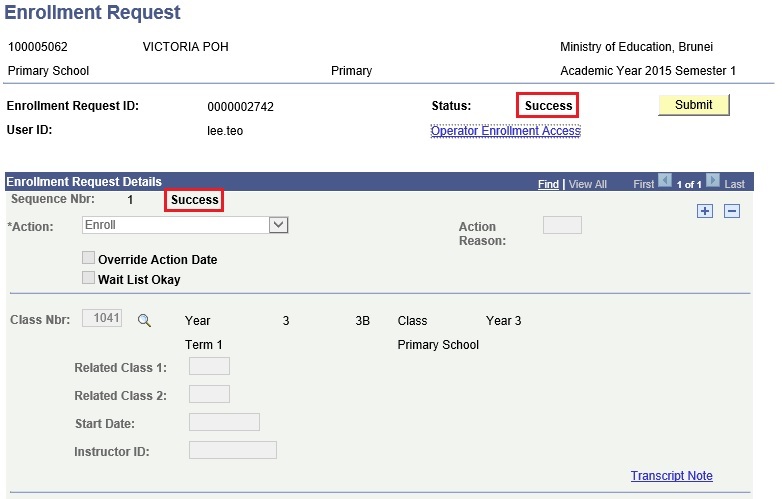 Upon submitting the Enrollment Request, the Status will be changed to ‘Success’. 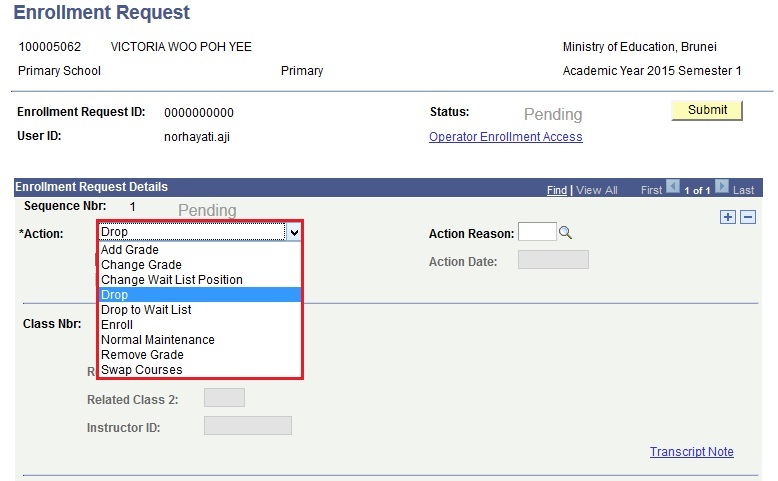 After the Enrollment of the student is successfully submitted for the first record, the user should also drop the student from the CCA Career. 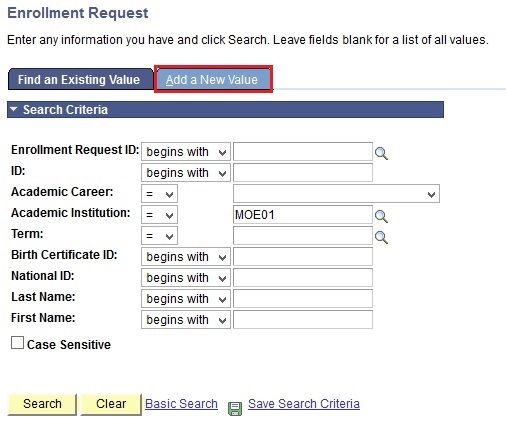 Navigate to Records and Enrollment > Enroll Students > Block Enrollment > Create Student Block. Enter the Student Block in the Student Enrollment Block field. User will be directed to the Block Enrollment Students page. 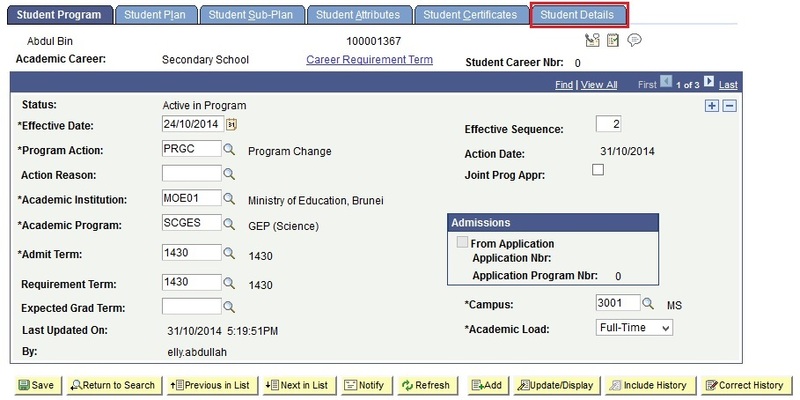 Update the Student Block by clicking on the ‘-‘ icon to remove the dropped student. 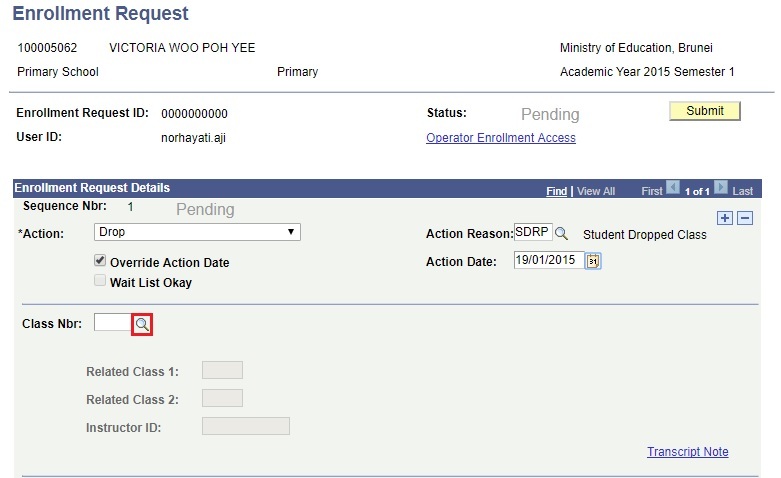 Enter the Student ID in the ID field of the student who is transferring-out of the school. 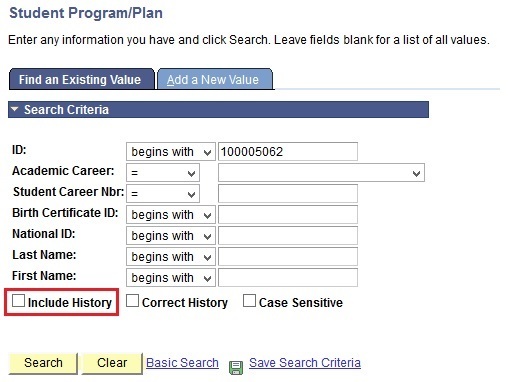 Select 'Include History' checkbox when searching. To enter the transfer record, click on the ‘+’ icon. 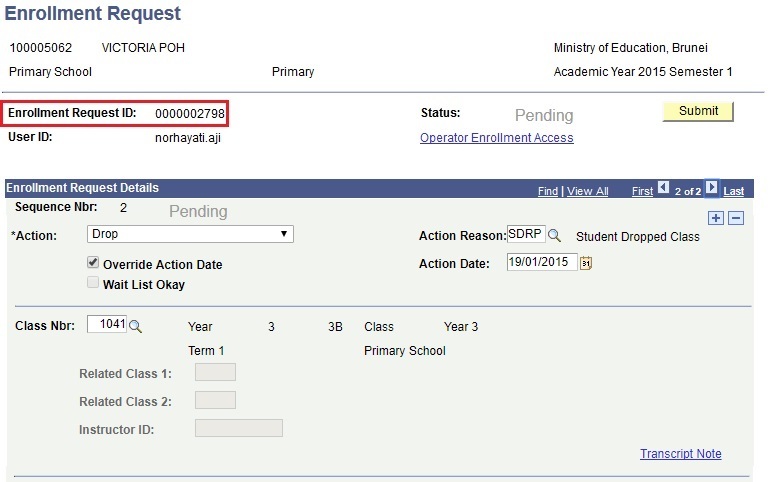 Click on the Calendar icon to select the *Effective Date of the transfer, which is the date from which the student will transfer from school. 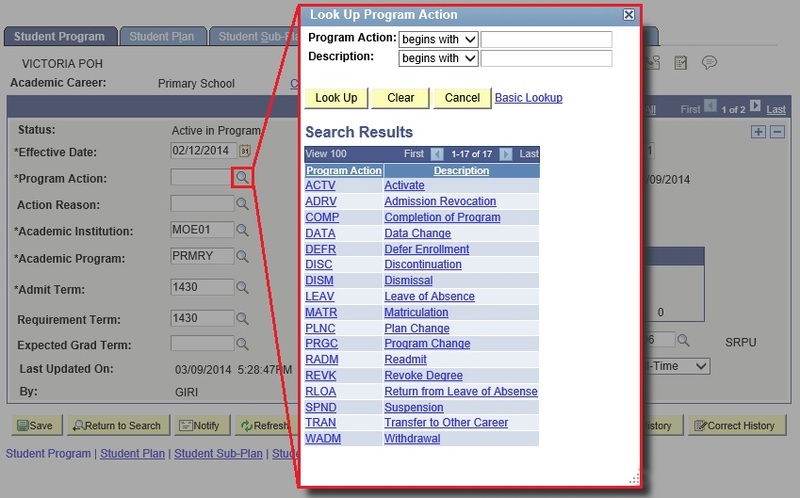 Select ‘DATA’ – Data Change in the *Program Action lookup. 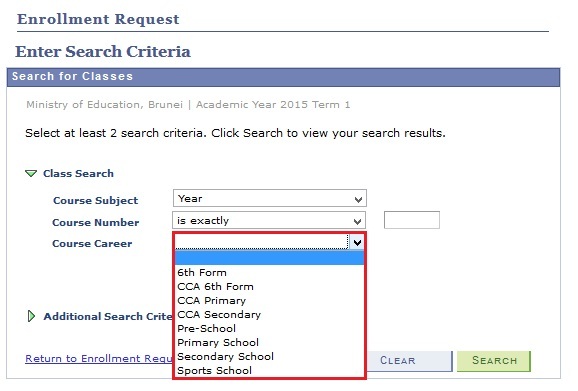 To select the reason mentioned in the Transfer Request Form, click on the Action Reason lookup. 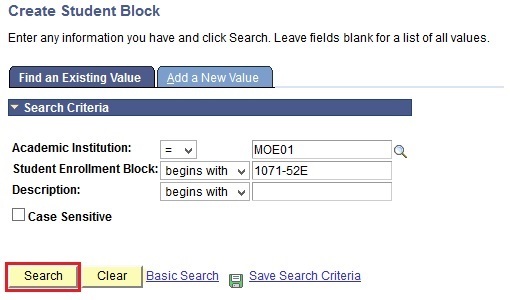 Click on the *Campus lookup to search for the requested campus. 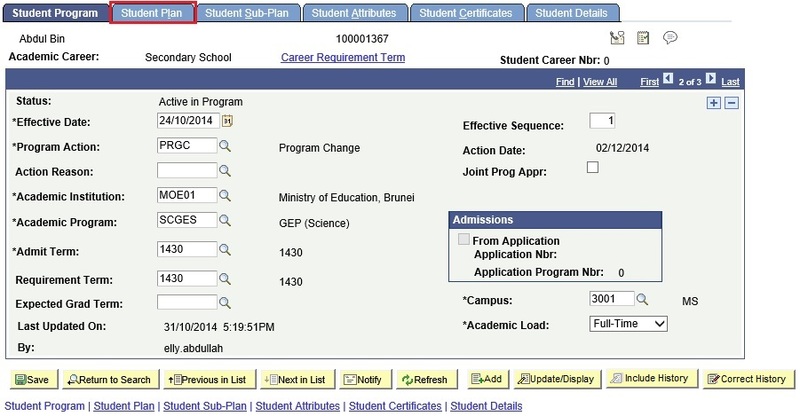 Click on the Save button to save the Student Program/Plan. 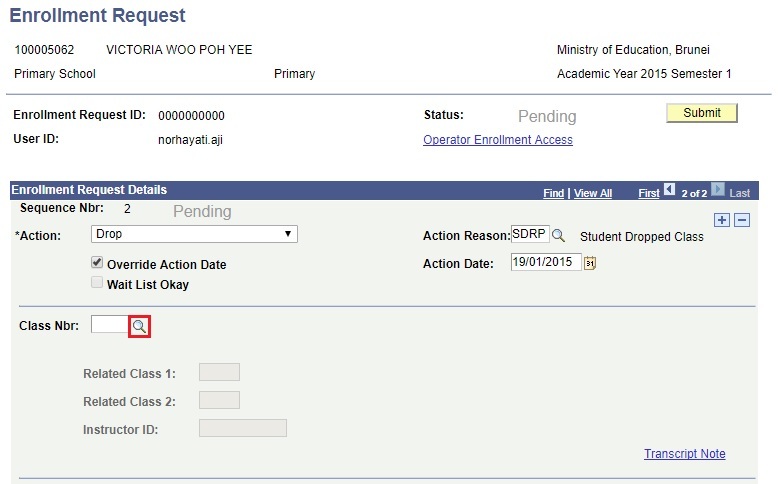 Enter the Student ID in the ID field of the student who is transferring-out to another class. 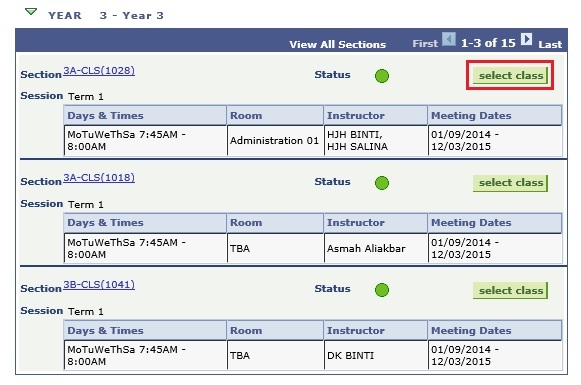 Click on the Calendar icon to select the *Effective Date of the transfer, which is the date from which the student will transfer from current class. 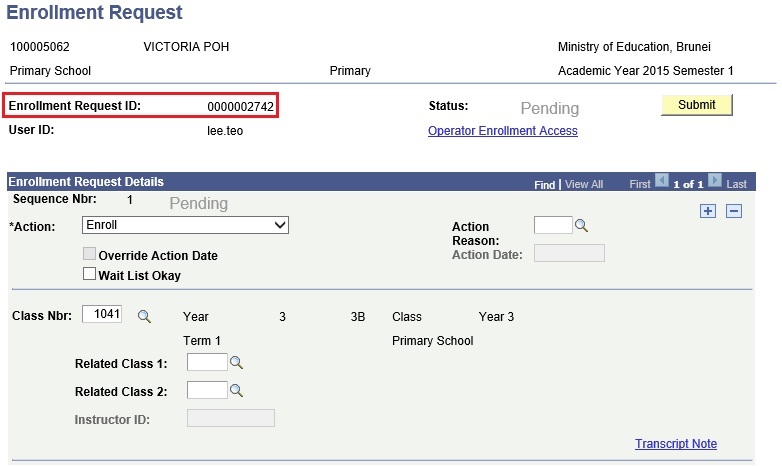 To select the reason mentioned in the Transfer Request Form, click on theAction Reason lookup. 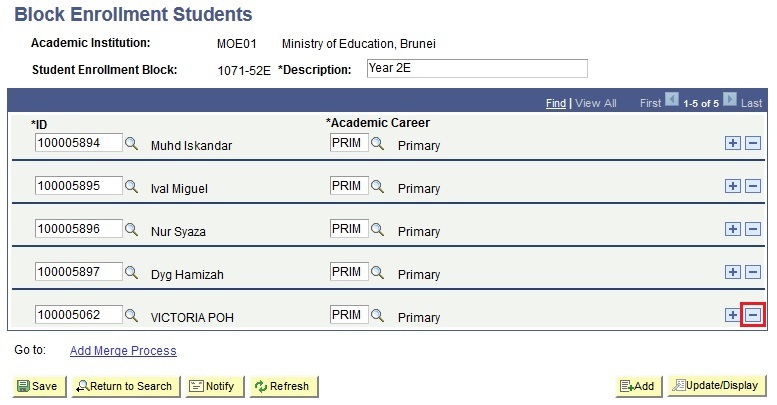 Click on the Student Details tab to update the class information. Update the Class Section to the Requested Class Section. 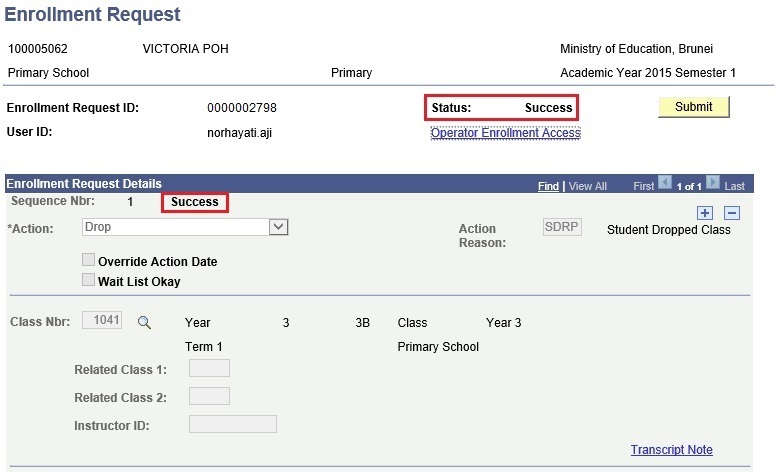 Click on Save button to save the transfer record for the student. Steps 14 to 22 are ONLY applicable for students who are transferring to another class and at the same time changing the Academic Program. E.g. : Secondary School student who will change from Express Track to Normal Track. 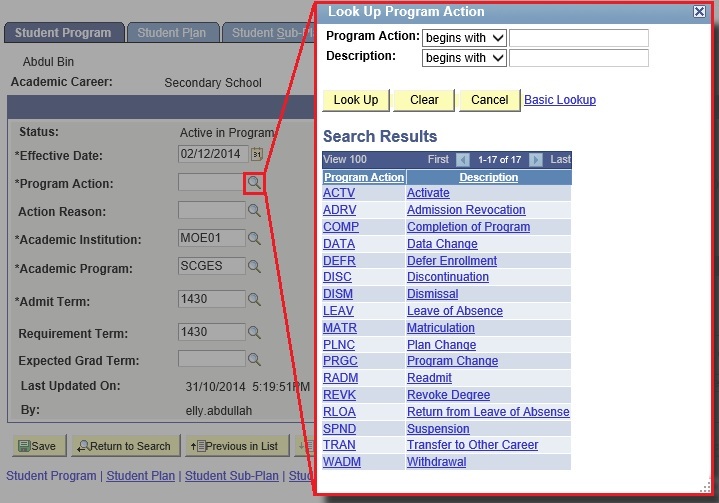 Select ‘PRGC’ – Program Change in the *Program Action lookup. 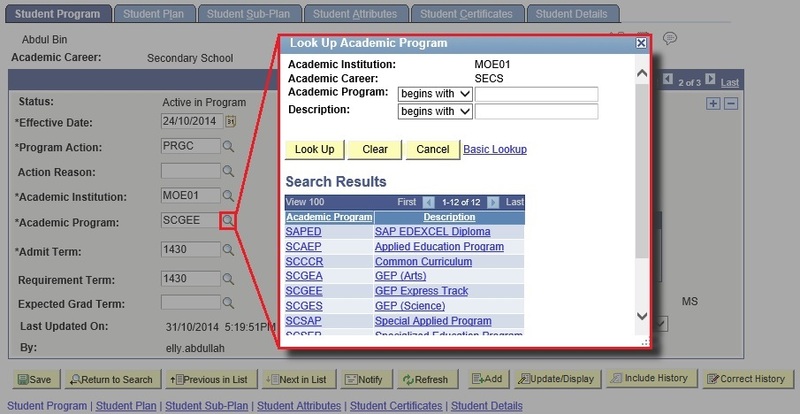 Select the new Academic Program the student is changing to in the *Academic Program lookup. The Admit Term selected should be the same as the previous record. 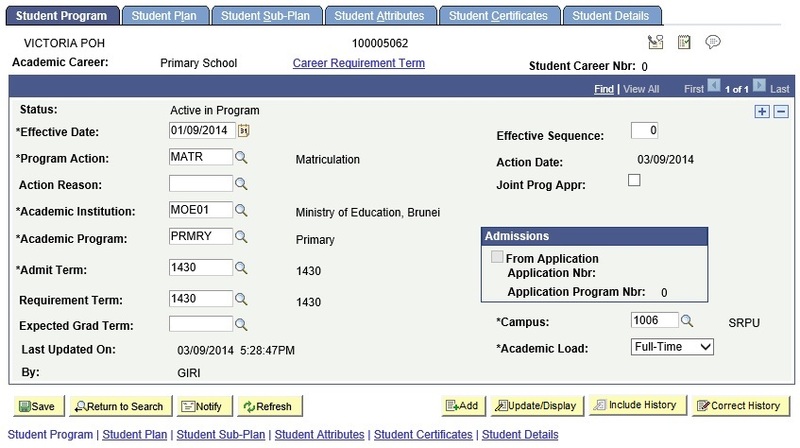 Click on the Student Plan tab. 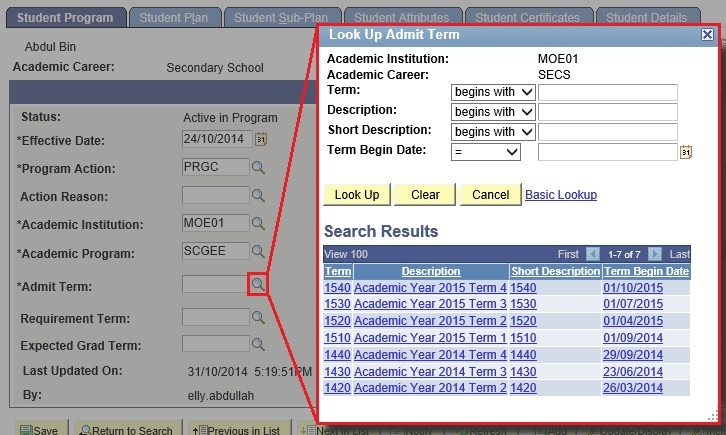 Select the Academic Plan in the *Academic Plan lookup. Change the Class Section to the Requested Class Section. 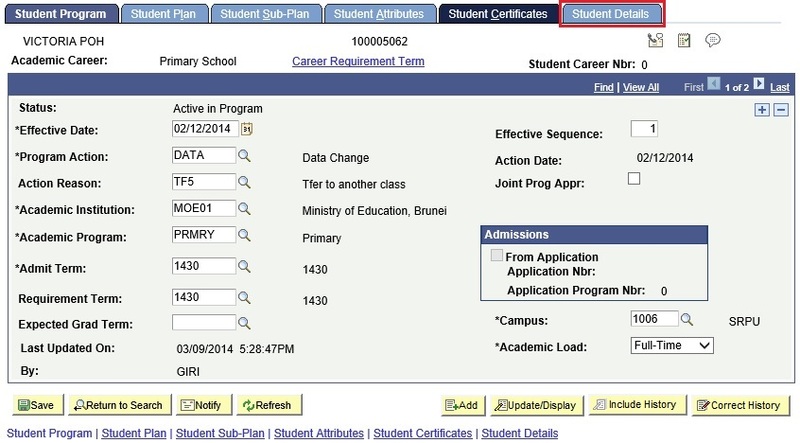 Click on Save button save the Student Program/Plan. Once a student transfers to the New School or new class, he/she has to be enrolled in all the classes associated with the new class assigned to him/her. This Enrollment will be done by either the New School Student Registrar (Transfer to another school) or Current School Student Registrar (Transfer to another class) depending on the Transfer type. 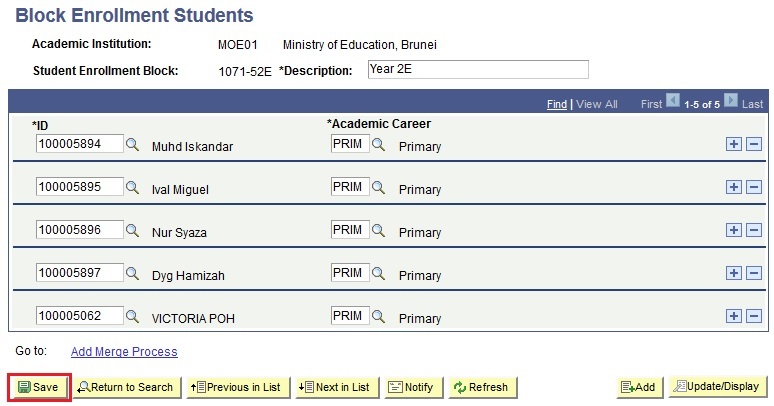 Click on the lookup icon to select the Term in which the Student has transferred from. 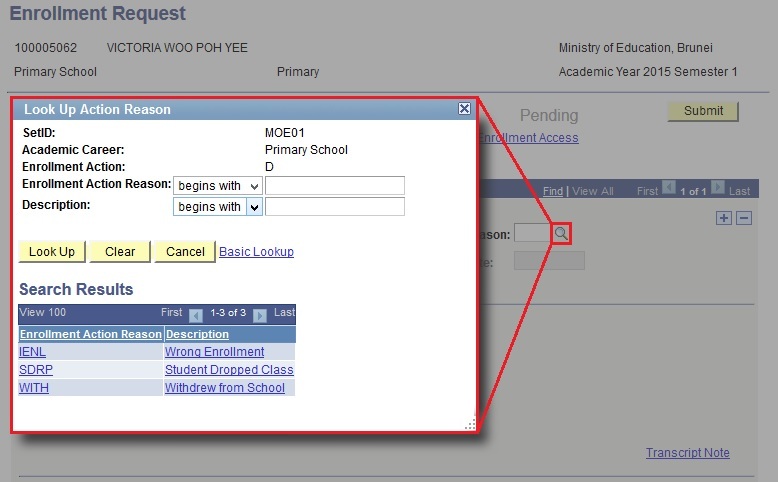 Select ‘Enroll’ from the Action drop-down list. 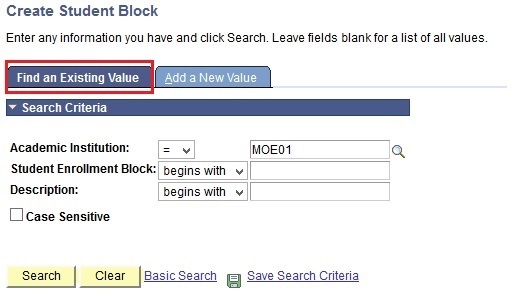 Click on the lookup icon to select the Class Nbr of the classes the student should be enrolled in. The classes needs to be searched one by one. 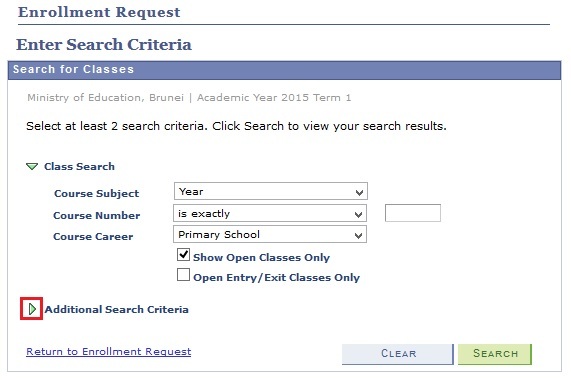 User will be directed to the Enrollment Request – Search Criteria page. 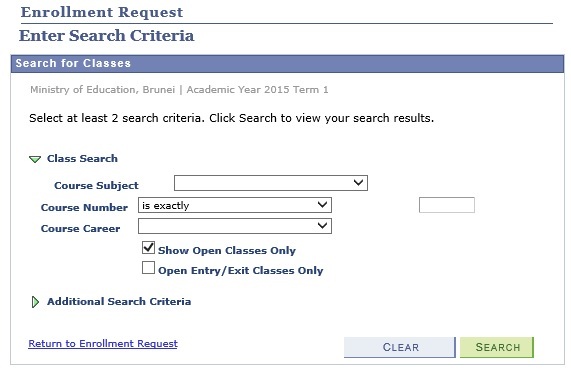 Select the Course Subject from the drop-down list. For the class section the Course Subject should be ‘YEAR’ and for the subject classes it should be the relevant subject. 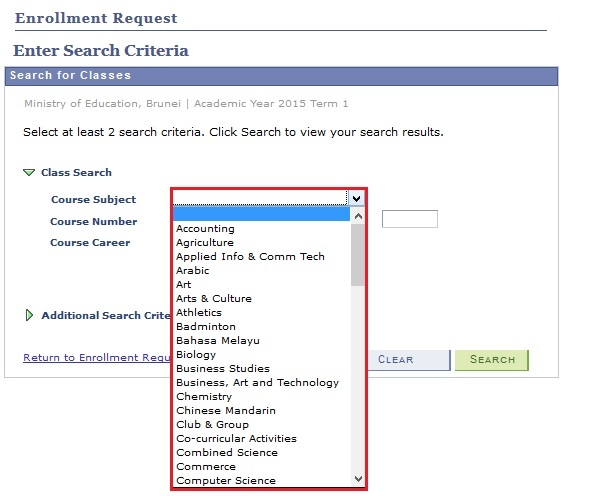 Select the Course Career from the drop-down list. Click on the arrow head against Additional Search Criteria. 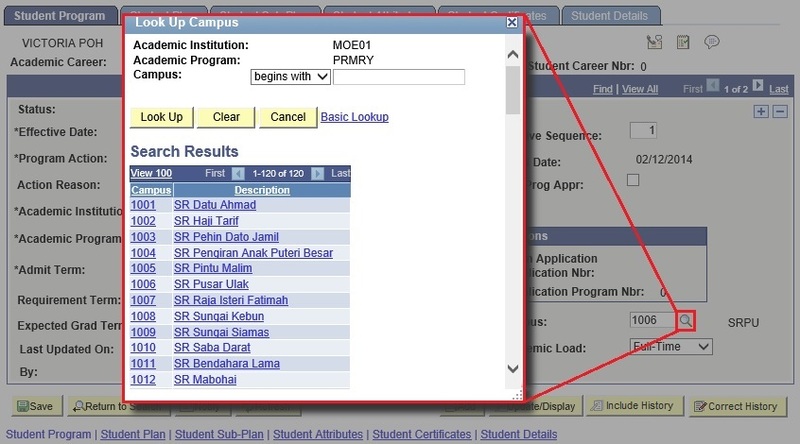 Scroll down to the Campus field and click on the drop-down list to select the campus/school of the user. 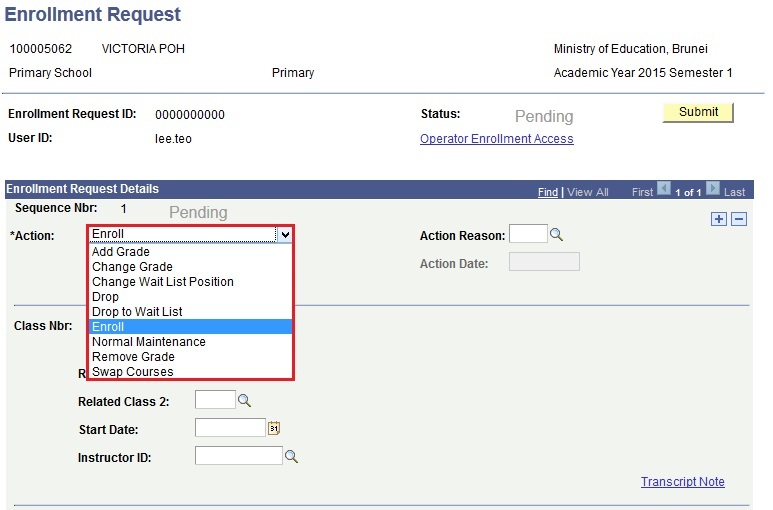 Select the Class the student is going to be enrolled in and click on Select Class button. To add other classes, click on the ‘+’ icon. Repeat the steps 9 to 16 for each class the student should be enrolled in, in the requested school/class. Everytime the ‘+’ icon is clicked, a new Sequence Nbr is added to add the Class Nbr. 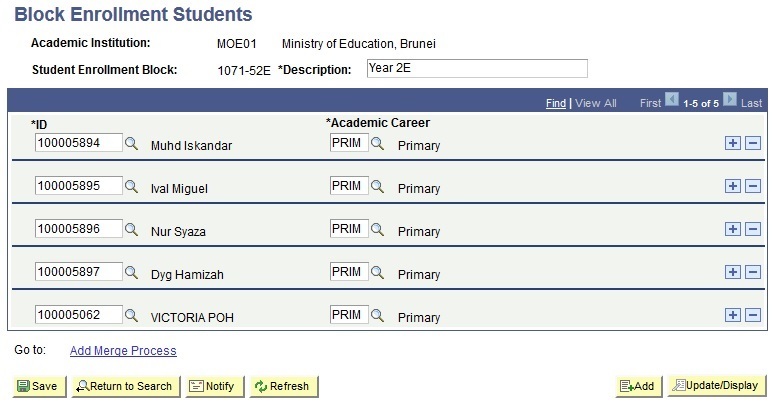 Update the Student Block by clicking on the ‘+‘ icon to add the new enrolled student. Click on the lookup icon to select the Student ID. 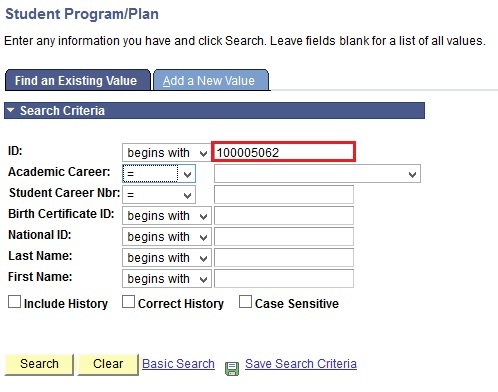 Click on the lookup icon to select the *Academic Career.